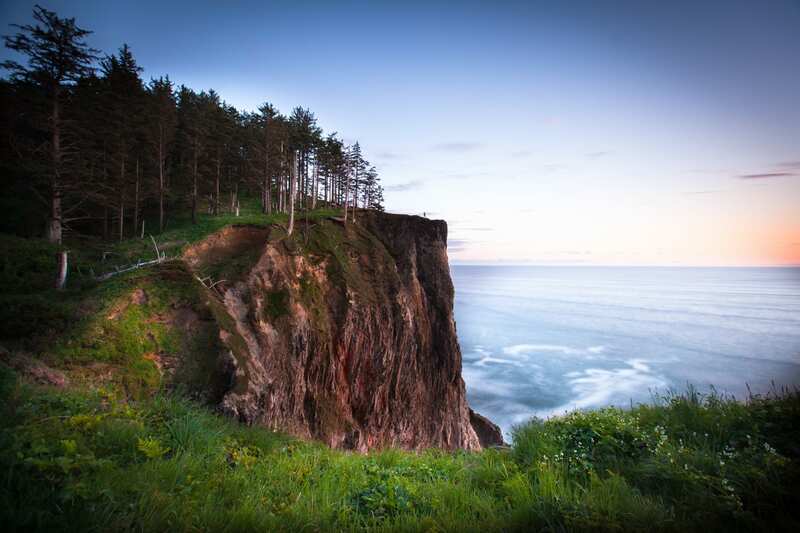 The Oregon Coast is one of the most scenic coastlines in the world and the perfect place for landscape photography. 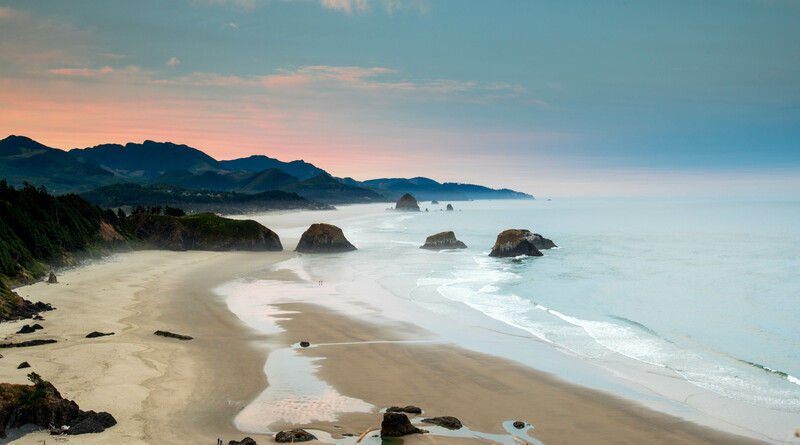 In 1967 the Oregon Legislature passed a landmark bill making the entire 364 miles of the coastline open to the public. This means that landscape photographers can travel and photograph the entire coastline. From the mouth of the Columbia River to Brookings the Oregon Coast is one of the most beautiful stretches in the world. 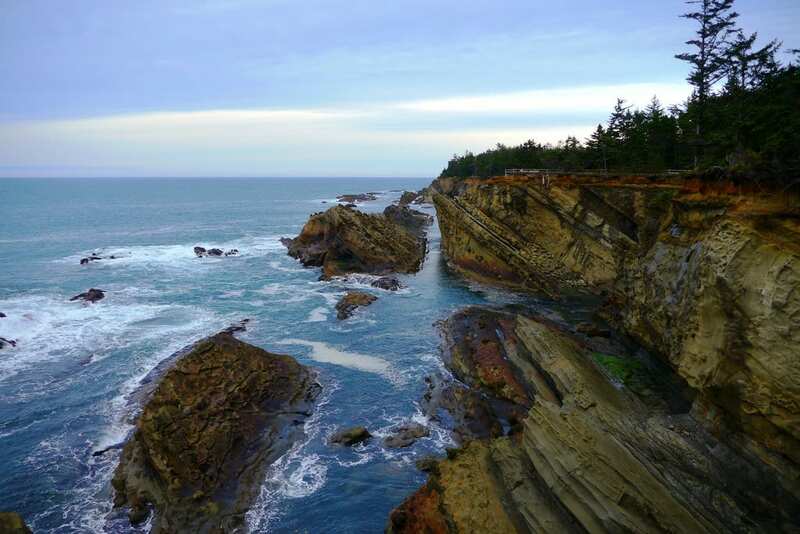 Some of the highlight include Ecola State Park, Haystack Rock, Short Sands Beach, Pacific City, Shore Acres, Cape Perpetua, and Samuel Boardman State Park. When traveling from North to South one thing you will notice is the coast gets more rugged as you go. In fact, on the Southern Coast you will find very few sandy beaches and mainly rocky coastline. 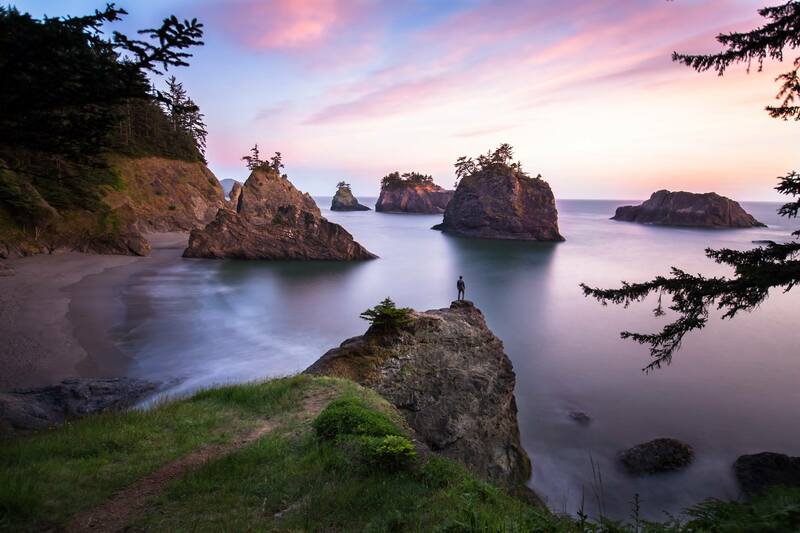 Here is our list of the 12 Most Beautiful Photography Locations on the Oregon Coast. 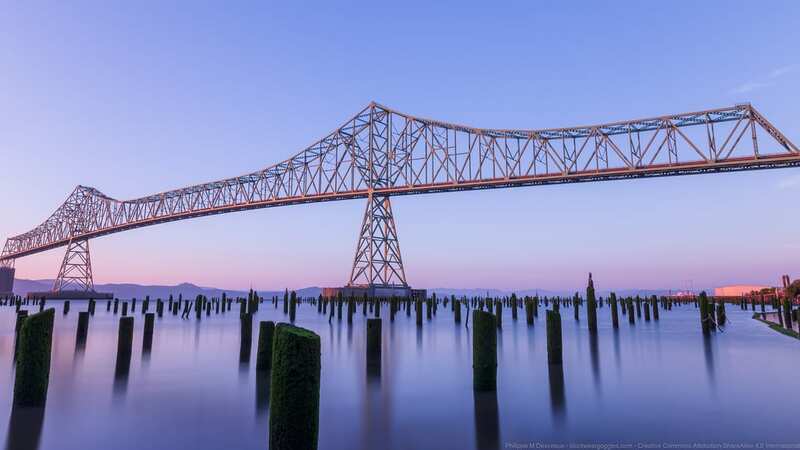 The first stop when traveling North to South on the Oregon Coast should be the Astoria Oregon. This historic settlement is near the mouth of the Columbia River and features many great photography locations including the Astoria Column, Columbia River South Jetty, and the Astoria-Megler Bridge. The bridge can be shot at sunrise or sunset, but if you’re looking for the perfect shot make sure you plan accordingly. This classic photo spot is one of the most popular on the North Coast. 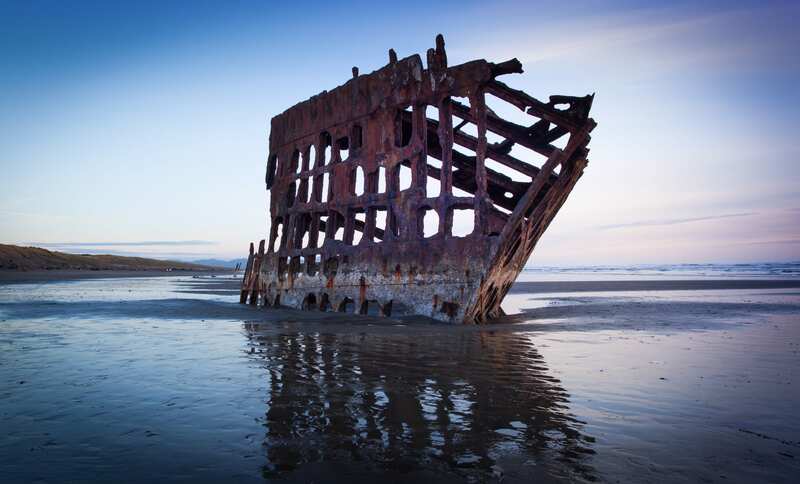 The ship ran ashore in October of 1906 and has been stuck in the sand ever since. Fortunately, this location is easily accessible through Fort Steven State Park, but does get crowded on weekends. The best photos are usually taken at sunset, but if the tide is right, sunrise can work as well. One of the most popular state parks on the Oregon Coast, Ecola features breathtaking views of Haystack Rock and Cannon Beach. Plus, Ecola has miles of hiking trails, beaches, and more. One of the most popular photography locations around means this place gets busy on weekends but don’t worry, there’s plenty of room to snap the perfect shot. Officially the most photographed location in Oregon, Haystack Rock is a 235 foot sea stack located in Cannon Beach Oregon. Many have claimed it’s the third-largest intertidal sea stack in the world. This beautiful rock is best photographed during sunset, but once again can get very crowded! If you’re looking to snap the perfect shot without people then a dawn patrol session may be your best bet. Oswald West is truly one of the crown jewels of the Oregon Coast. Featuring a popular surfing location and miles of trails through old growth forests makes this a great place to look for the perfect shot! Oswald West is located just North of Manzanita Oregon on Highway 101 with multiple parking lots that provide access to the park. Morning photography is challenging due to the Coast Range mountains to the east, but mid-day and sunset provide many great opportunities to capture the magic of the park. When it comes to picitureesqe photo locations, Cape Kiwanda is hard to beat! 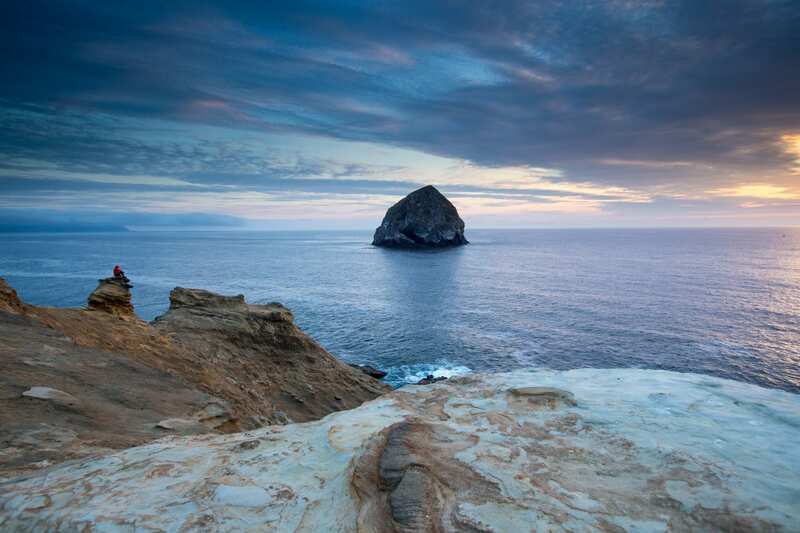 Located in Pacific City about 30 miles South of Tillamook, Cape Kiwanda provides multiple options to capture the perfect photo. This small community features multiple forms of recreation including surfing, boating, sand boarding, and more so it does get very busy on weekends. With that said, as long as you can find a parking spot, photographers will have plenty of scenic sites to shoot! 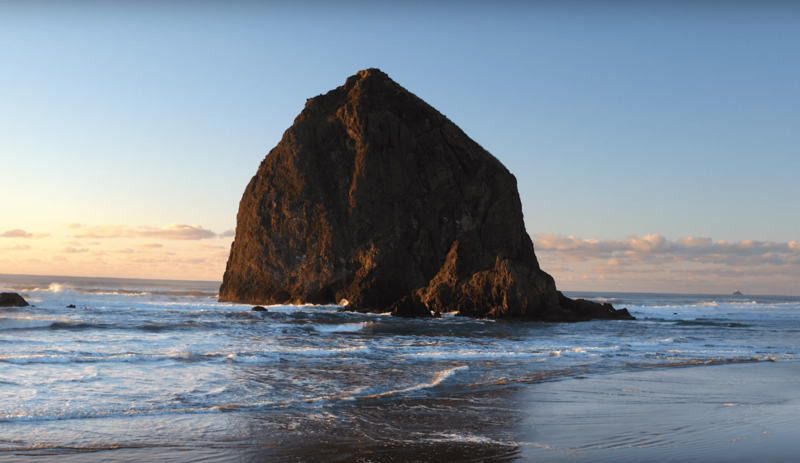 The legendary sand formations and Haystack Rock are best at sunset and potentially at sunrise (if you get lucky). Continuing south on our journey we drive through Newport. This rustic coastal town features multiple locations for photographers. 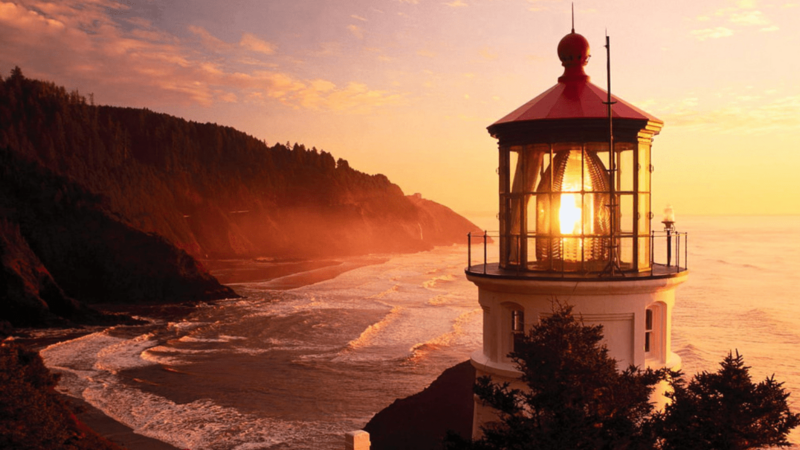 The first landmark you will pass is Yaquina Head Lighthouse State Park. This park features the Yaquina Head Lighthouse which is a classic photo location. As you continue south you will drive over the Yaquina Bay Bridge which is another popular spot. 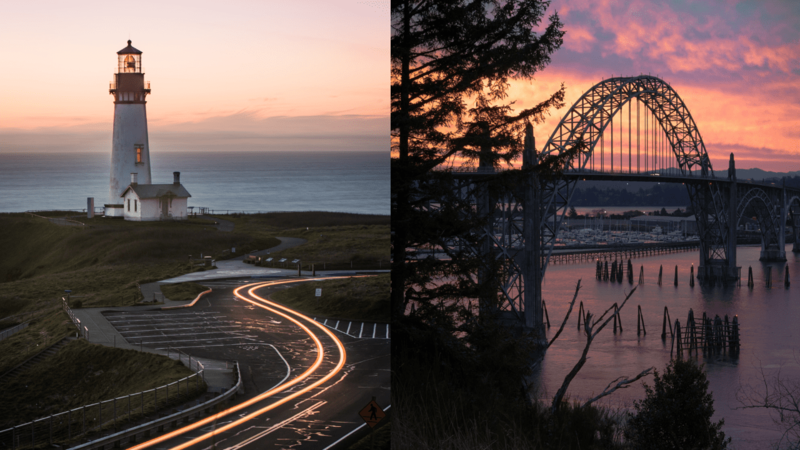 Your best bet to capture magic at the lighthouse will be at sunset while Yaquina Bay Bridge comes alive at sunrise. Make sure to get their early because the morning colors usually only last a few minutes! Just 6-miles south of Yachats you will drive by Cape Perpetua State Park. 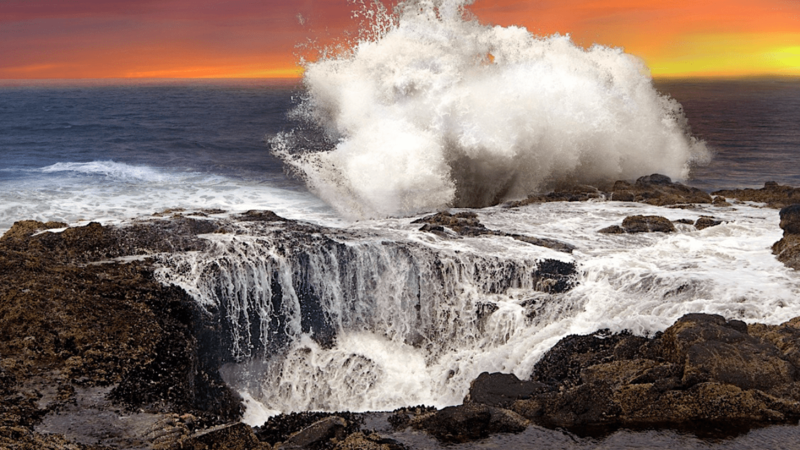 This extremely popular roadside attraction features iconic natural wonders including Thor’s Well and Spouting Horn. There’s also multiple hiking trails that allow you to get a birds eye view of the beautiful coastline. Due to the Coast Range mountains to the east, Cape Perpetura is best photographed during sunset. If you’re looking for the perfect shot of Thor’s Well there’s also tidal factors to consider, but when the stars align you can definitely capture a magical image. Hecta Heat Lighthouse is one of 12 scenic lighthouses along the Oregon Coast. Located just 13 North of Florence, this lighthouse is best photographed during sunset. There is a great viewpoint right along highway 101 plus visitor access right up to the lighthouse itself, gives you many great locations to grab the perfect snap. Shore Acres State Park is located 25 miles West from Coos Bay Oregon. The park is located well removed from highway 101 which keeps the crowds down. This scenic shoreline is a must see area of the coast, but is best viewed in the winter months when the waves hit the rocks and kick up massive ocean waves. If you’re looking for the perfect photo plan your trip in the winter months when the swell is 10 or more feet. 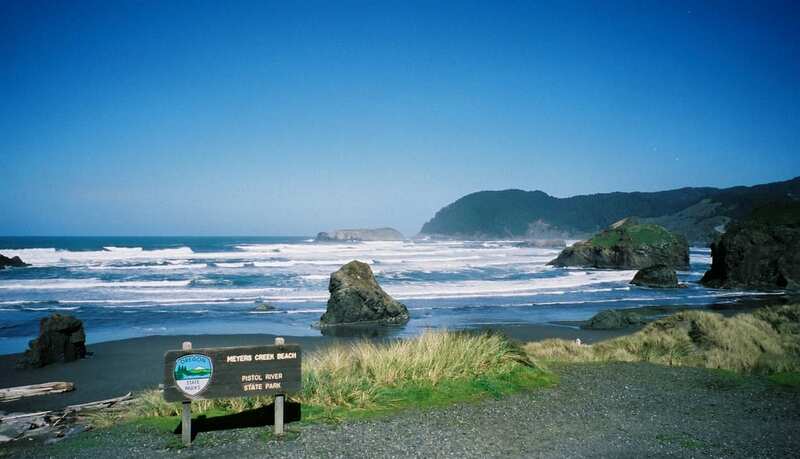 Drive 21 miles south of Gold Beach and you will reach Pistol River State Scenic Viewpoint and Myers Creek Beach. This gorgeous stretch of Highway 101 is known for it’s rugged coastline and jaw-dropping long exposure shots. The perfect curve in the road along with scenic rocks in the background. This photo really doesn’t do the area justice, but will give you a glimpse into the rugged scenic landscape. Lucky for you we saved the best for last! Without a doubt, the Samuel H. Boardman Scenic area is home to the most breathtaking landscapes on the entire Oregon Coast. The 12-mile long scenic corridor is packed with dozens of jaw-dropping photo locations including Secret Beach, Natural, Bridge, Indian Sands, and more. Plus, due to its isolation from the big population centers the park is relatively uncrowded making it the perfect spot to go exploring! 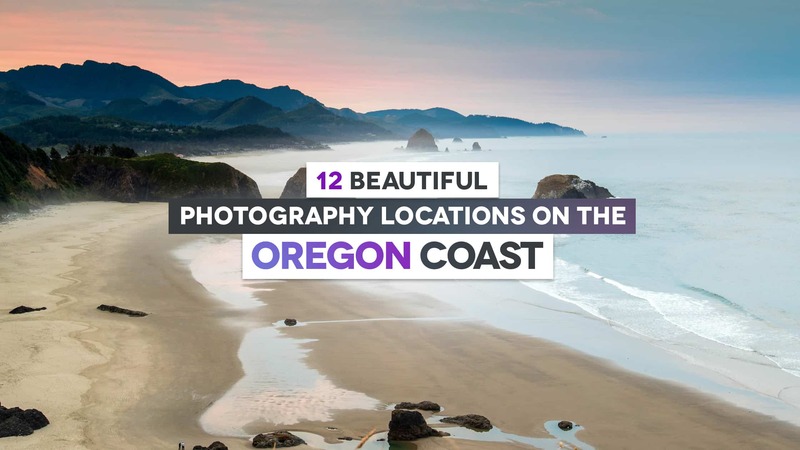 Thanks for reading the top 12 best photo locations on the Oregon Coast. I hope we inspired you to get out there and explore. If you’re interested in learning more about Morrisey Productions visit our website. Many thanks for the great list! There’s so many beautiful places on the Oregon coast, it’s really hard to go wrong anywhere, but the ones you have here are amongst the best (and there’s a few here I’ll need to explore further). A personal favorite is Harris Beach State Park. Although it can be crowded in the summer, some great photos can be done off season (especially early morning and late evening). Thanks again! Great tip! I’ve been up and down the Oregon Coast dozens of times but i’ve only been to Harris Beach State Park once. Next time i’m in the area, I will make it a priority to stop and explore.